The Grand Theft Auto IV Era refers to a canonical era of Grand Theft Auto games, which includes Grand Theft Auto IV, its two expansion packs (The Lost and Damned and The Ballad of Gay Tony), and Grand Theft Auto: Chinatown Wars. All GTA IV Era games are set in Liberty City. They all take place in the HD Universe, as designated by Rockstar. These games are grouped together mainly because they have interlinking characters, storylines, and locations, specifically GTA IV's rendition of Liberty City and the state of Alderney. This is also known as the fourth generation of GTA games released from 2008 to 2010. With a few exceptions (most notably dialogue by radio host Lazlow on Integrity 2.0 which makes frequent references to locations in earlier games, and the use of some footage from Grand Theft Auto: San Andreas in some TV programmes), the GTA IV games are not considered to exist in the same "universe" or continuity as any of the games of the GTA III Era. Grand Theft Auto V starts a new era, but is part of the same Universe as the GTA IV Era. This means that some characters, businesses and some storylines could cross over into the new era. However, the vast majority of features and characters will not appear in the GTA V Era. Grand Theft Auto IV Grand Theft Auto IV (2008) is set in Liberty City in 2008. It was the first GTA game to be released simultaneously for the PlayStation 3 and Xbox 360 consoles. In August 2008, Rockstar announced that they were going to publish GTA IV for PC. GTA IV's game engine is the Rockstar Advanced Game Engine (also known as RAGE) used in Rockstar Games presents Table Tennis and the Euphoria physics engine. The game takes place in a redesigned Liberty City that very closely resembles New York City, much more than previous renditions. The protagonist is Niko Bellic, a 30 year old war veteran from the Balkans. Grand Theft Auto: The Lost and Damned The Lost and Damned (2009) is the first of the two episodes for GTA IV. The DLC version of TLAD requires the original GTA IV to play and is also available on Xbox 360, PlayStation 3 and PC. It is included in Episodes from Liberty City, which does not require GTA IV. TLAD's storyline runs alongside the main GTA IV storyline and the protagonist is Johnny Klebitz, Vice President of the Alderney Chapter of The Lost Brotherhood. Grand Theft Auto: The Ballad of Gay Tony The Ballad of Gay Tony (2009) is the second episode released for GTA IV. 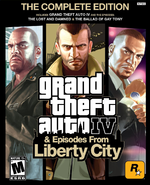 Like TLAD, the DLC version requires the original GTA IV to play, but it is also included in the standalone Episodes From Liberty City. TBoGT's storyline also ties in with the main GTA IV storyline, as well as TLAD. The protagonist is Luis Fernando Lopez, and the story follows him and his boss Gay Tony, who is losing his proprietorship in his clubs in the city. This game completes the GTA IV Era trinity. Grand Theft Auto: Chinatown Wars Grand Theft Auto: Chinatown Wars (2009) is set in Liberty City in 2009, a year after the events of GTA IV and the two DLCs with a story focusing on the Liberty City Triads. It is the first Grand Theft Auto game to be released on the Nintendo DS, and was announced at the E3 Nintendo Press Conference on July 15, 2008. This game has several new features, such as touch screen mini-games. It is also available on the Sony PSP and Apple iPhone/iPod Touch. The PSP version features drastically improved graphics. The game focuses on the Triads, and protagonist Huang Lee, the twenty-five year old nephew of Lee Family head Wu Lee. The game's storyline does not intertwine with those of GTA IV and its episodes, nor is it part of the trinity that connects them, leading some to question its canonicity. The Main story and it's episodes' missions and how they connect can be viewed in the Missions in GTA IV Era page. This page was last modified on 18 May 2013, at 19:31.